Something nice happened to us while we were preparing the schedule for Ebertfest 2012, which plays April 25-29 at the Virginia Theater (above) in Champaign-Urbana, Ill. We'd invited Patton Oswalt to attend with his "Big Fan. He agreed and went one additional step: "I'd like to personally choose a film to show to the students, and discuss it." That sounded to me like a splendid idea, embodying the spirit of this festival, which combines the love of good films with volunteerism. This is a rare festival where no business takes place. No films are bought or sold. No deals are signed. It's simplicity itself: We join in a classic 1920 palace, 1,600 of us, and watch a film as it should be seen, on a vast screen with perfect sound. Then we talk about them afterwards. The festival and the theater come to us through the work of countless volunteers from the University and the community of Champaign-Urbana. On a more mundane level, the considerable cost of the festival isn't met by ticket sales, and is offset by our generous sponsors, who you'll see thanked on the screen before every screening. 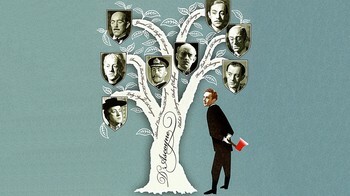 Oswalt's choice to show and discuss is a natural for him: Robert Hamer's "Kind Hearts and Coronets" (1949), starring Alec Guinness--who plays eight different members of the same family, men and women, ranging in age over six decades. Sir Alec's other roles in a long career included Hitler and Obi-Wan Kenobi. The movie will be shown free and open to the public at 10:30 p.m. April 26 in Foellinger Auditorium (a new day and time made necessary because of a change in the shooting schedule of Oswalt's new film). Patton Oswalt himself suggests the same versatility; think of the gulf between his characters in "Big Fan" and 2011's "Young Adult." In seeing "Big Fan" I was struck by how deeply he penetrated to the heart of the character, sidestepping obvious openings for easy comedy and asking himself what many of us must have wondered: Who are those people who seem to live on sports talk radio, as all-knowing experts on first-name terms with the host? "Big Fan" illustrates something I believe: The more specific a performance is, the more universal it can become. The film plays at 1 p.m. April 26. Now I'd like to discuss the rest of our selections in the order they will appear. As always, they were selected by me, in consultation with the festival director, Nate Kohn. My wife Chaz, who will reprise her popular role as emcee, also had major input. 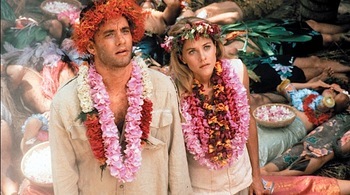 "Joe Versus the Volcano" (1990) will play at 7 p.m. April 25, as our opening night film. No film has almost played in Ebertfest more often than this one. Nate may be able to confirm that it's been shortlisted in at least ten of the past years. Something always came along to crowd it out. Because it was often rumored to be a selection, people started to badger me about when they'd finally be able to see it, and we determined that this would be the year. As you will see, John Patrick Shanley's film is so visionary and epic in conception that it really requires a big screen like the Virginia's to make its ideal impact. I can't wait to see again that early scene of dark skies lowering over its factory -- a vast block of ugliness set down in the middle of a field of mud. Tom Hanks stars as the worker who hates his job so much he welcomes a death sentence from his doctor. In the spirit of Alec Guinness, Meg Ryan plays three different roles in the film: As Joe's secretary, and both daughters of Granamore (Lloyd Bridges), who wants to hire Joe to be a human sacrifice. As I wrote in my review: "I had not seen this movie before. Most movies, I have seen before. Most movies, you have seen before. Most movies are constructed out of bits and pieces of other movies, like little engines built from cinematic Erector sets. But not 'Joe Versus the Volcano'." I continue to believe it deserves greater recognition, and cannot understand why I gave it 3.5 stars instead of four. "Joe" will be followed on opening night by a documentary and a short spotlighting the prosperous new generation of African-American comedians. In John Davies' "Phunny Business: A Black Comedy," at 10:15 p.m. April 25, we learn that an amazing number of those careers were launched by a black comedy club in Chicago named All Jokes Aside. 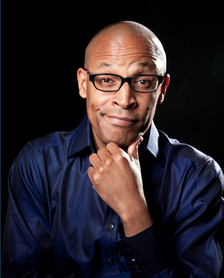 Name the successful black comedians since 1990 who didn't begin there, and you'd be making a very short list. The film is fascinating for its memories of big names early in their careers, but also for its inside look at Raymond C. Lambert, the businessman who ran it with precise professionalism and steered it through the high seas of Chicago finance and politics. There's an ironic lesson of some sort to be learned when the club is finally undone by its own success. And a sad old lesson when it confronts racism. Ray Lambert will be with us in person. 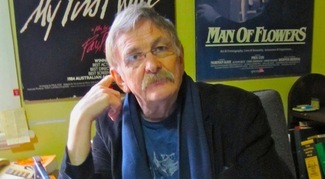 Also John Davies, the director, who began in Chicago television an unthinkable number of years ago by producing for Gene Siskel and me. Also live! on our stage! 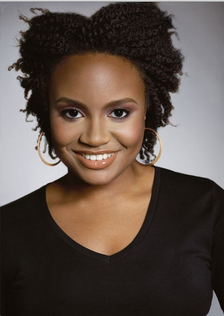 will be the rising young African-American comedienne Kelechi Ezie, who will show her short "The Truth About Beauty and Blogs," at 10 p.m. After both films screen, she and Lambert will discuss the current situation in her business, as contrasted to the All Jokes Aside scene 20 years ago. On Thursday, April 26, after "Big Fan," we'll show another of this year's new discoveries, "Kinyarwanda," at 4 p.m. The film was made on a tight budget and shooting schedule and uses all local actors in Rwanda, but it could not be more effective or look more professional. Watching it made me realize that "Hotel Rwanda," powerful as it was, gave the view from the top, and "Kinyarwanda" puts us inside the situation at ground level. Rwandans commit the murders, suffer from the murders, recover and repent. Interlocking vignettes establish a vivid group of characters. Each one adds to the mosaic. Characters from one turn up in another. Gradually a powerful outcome is arrived at. Finally Muslims and Catholics link hands to face the bloodthirsty killers. What we're seeing is South Africa's truth and reconciliation process at work in another situation. Among our guests will be Alrick Brown, the Jamaican writer-director; Cassandra Freeman, who plays Lieutenant Rose, and other members of the production team. "Terri," at 8:30 p.m. April 26, contains two immediately convincing performances, by Jacob Wysocki as an overweight and bullied 15-year-old, and John C. Reilly as an assistant principal. It's easy to imagine that Reilly might also have been bullied in school. The film shows how their relationship deepens and develops, and enlists our sympathy for a fat kid who wears pajamas to school "because they fit." At a time when bullying is being much discussed, the film could not be more timely. But it isn't a simple message movie; it's a subtle and warm-hearted exercise in empathy. Wysocki, a rising young star, also stars in "Fat Kid Rules the World," which just won an Audience Award at SXSW. What I admire about this film is how observantly it creates his character's entire world, including his troubled home life, his peers, and the solace he finds in solitude. Both Wysocki and Azazal Jacobs, the director, will be with us in person. "On Borrowed Time," a documentary filmed largely during the most recent two years of Paul Cox's life, will play at 1 p.m. Friday. Ebertfest has had no better friend than Cox, who has visited us for the screenings of three of his films, "A Woman's Tale," "Innocence" and "Man of Flowers" (he holds the festival record). From the day in 1983 I saw "Man of Flowers" at the Chicago Film Festival, I've considered Paul one of the most principled, sensitive and gifted of directors, and his warmth will be known to the many who've met him here. Paul very nearly died in 2009. His life was saved by a liver transplant on Christmas Day of that year, which came at the last moment after a heartbreaking series of delays. David Bradbury had already started making this documentary when Paul received his terrifying diagnosis, and continued to film as Paul confronted the prospect of death. Cox is considered one of Australia's national treasures, and we see here how his vision and spirituality helped sustain him through the crisis. Paul will be joined on stage by Nate Kohn, who has become his close friend. This year's Ebertfest is dedicated to Paul Cox. 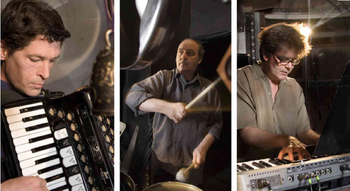 The Alloy Orchestra returns to Ebertfest for the 12th time this year. Known globally for their original compositions which accompany silent films, they're based in Cambridge, Mass. Devoted lovers of silent films, they've made many converts; festival-goers have told me they began to explore cinema's first 30 years after being introduced to silent films by the Alloy. On their travels, they usually showcase feature-length films. But especially in the early years, a great many films were shorts. They've compiled a special program sampling those riches, and call it "Wild and Weird," playing at 4 p.m. Friday. We will be joined in the orchestra pit and onstage by the Alloy's members, Roger Miller, Ken Winokur and Terry Donahue (l-r above). This screening is sponsored by Steak 'n Shake. "A Separation," at 8:30 p.m. Friday, scarcely needs my introduction after winning this year's Academy Award for best foreign film. But it was scheduled for Ebertfest 2012 long before that happy day, and Nate and I had it on our schedule soon after I saw it at the Toronto festival in September 2011. It was my choice for the best film of last year. This is an extraordinary film, taking on an intractable moral dilemma and considering it in such observant terms that we learn an enormous amount about the Iranian society and its people. Given the constraints on filmmakers in Iran, where the director Jafar Panahi is now in prison, "A Separation" is an impressive feat for its director Asghar Farhadi, who focuses on the personal stories involved and leaves it to the audience to determine right and wrong. "I like to put a question mark around the issues I'm concerned about," Farhadi told me in an interview. "This is a way of inviting the viewer to critique, without my views getting in the way. I prefer to add numerous question marks to every issue. I think a cinema that asks questions is preferable to a cinema that is stylistically critical." Farhadi has told us he hopes to attend the screening. 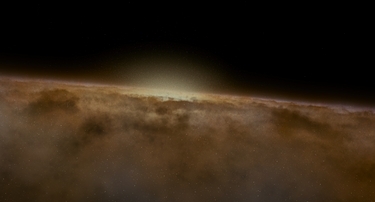 Remember the astonishing visuals in Terrence Malick's "The Tree of Life" that evoked the Big Bang and the evolution of life? Those were created in Urbana by by the Advanced Visualization Lab and theeDream Institute at the National Center for Supercomputing Applications, which specialize in scientific visualizations for movies and large-screen productions. How were they done? There'll be a demonstration of NCSA's techniques from 9 to 11 a.m. Saturday in the Pine Lounge of the Illini Union, with moderators Donna Cox and Robert Patterson. "Higher Ground," at 1 p.m. Saturday, is a triumph for Vera Farmiga, who directed and stars in it. It shows us a woman whose need for religion, and her relationship to it, changes over the years. We see her as a child, as a young woman of about 20, and again around 40. It is especially perceptive in showing the way that belief, for her, is founded to begin with on personal relationships with fellow believers and her church, and later deepens and is challenged by her accumulating life experience. Like "Terri" and "A Separation," this is a film about issues which avoids a message. It doesn't tell us what to believe, nor does it judge what the heroine believes. It stands aside from a set interpretation of right and wrong, and shows us the character Corinne in context, as she tries to make the right decisions for herself. The screenwriter, Carolyn S. Briggs, will appear in person. "Patang," at 4 p.m. Saturday, was an entry in the 2011 Chicago Film Festival, when I first viewed it. I immediately thought of it for Ebertfest. I was struck by the skill of its director, Prashant Bhargava, in introducing a large number of characters and organically showing us how they interacted, particularly within a family. The movie has interlocking stories that are clear enough, but it doesn't follow a rigid narrative map. It reminds me more of Robert Altman's gift for plunging into the middle of a community of characters and giving them freedom. What a delight it was to learn more about the filmmaker. Bhargava was born and raised on the South Side of Chicago, went to grade school and the Kenwood Academy. About 25 years ago, his father, Vijay Bhargava, started taking my film class in the University of Chicago's Fine Arts Program. He was one of my favorite students; we sat next to each other in the back row, munching on oatmeal cookies (I munched, anyway). He and his family made many trips home to relatives in India, and from what he observed there, Prashant was inspired with the idea of this film. He told me: "Dad spent over 25 years working in the administration of Michael Reese Hospital. After 20 years of attending your class and supporting my career as a director and designer, he has taken up acting! He has taken over 25 classes at Chicago's Act One Studios." Prashant, his father, and many actors and crew members will attend the screening. 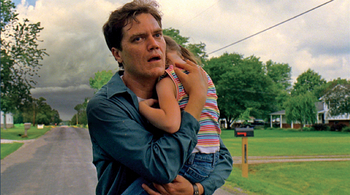 "Take Shelter," playing at 8:30 p.m. Saturday, is the second Ebertfest film directed by Jeff Nichols and starring Michael Shannon. "Shotgun Stories" played here in 2008. This film struck me immediately as featuring one of the best performances of the year, and the failure of the Academy to nominate Shannon is an indication of the fairly narrow range of films it considers. It seems clear to me that Shannon and Nichols must have worked closely together to create the tension in this film between reality and paranoia. 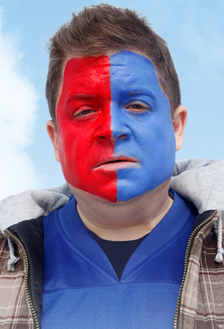 Curtis, the family man played by Shannon, seems disturbed in ways we can't quite put our finger on. Yet the events that terrify him seem real enough. Again this year the nation is being punished by one horrible tornado after another, and if a father takes dramatic steps to try to protect his family, isn't that justifiable? The film does a masterful job of creating its family (Jessica Chastain is effortlessly convincing as the wife), and Nichols has a sure touch for small town life. Scenes like the pancake breakfast are filled with small visual details that will be familiar to anyone who has ever attended one. And consider the scene when the wife tells her husband it is time for them to go outside again. The acting, the direction and the camera strategy are uncanny. This screening is sponsored by the Champaign County Anti-Stigma Alliance. Michael Shannon, Jeff Nichols and Sony Pictures Classics co-president Michael Barker will be present in person. 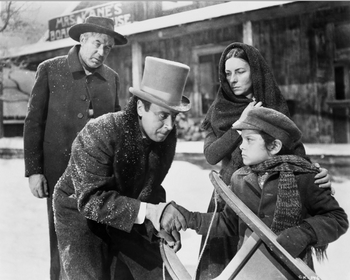 "Citizen Kane" plays at noon on Sunday. It is often voted the greatest film ever made, but I imagine everyone in the theater will have seen it before. So why show it? Two reasons: (1) More than most films, it benefits from additional viewings. And (2) several years ago, when I could still speak and all of my troubles were in the future, I recorded a commentary track for the Warner Bros. DVD. It was named by Variety's Video Premiere edition as the best commentary track of the year. It occurred to me that playing the commentary track might be a way to sneak my speaking voice back into Ebertfest. In the early years of the festival, one of my great joys was to participate in the onstage discussions after each film. These days I love the sessions led by our guest moderators. But indulge me and allow my voice to be heard one more time in the Virginia. Using the scene-by-scene technique, I've often gone through "Kane" and other films with an audience. The ground rules are simple: We show the film. When anyone in the room sees something they want to discuss, they call out "Stop!" and we freeze the frame and discuss it, sometimes nudging the film forward or back one frame at a time. In the early days, we did this on 16mm. Then laserdiscs. Then DVDs. Now we have the new Blu-ray 70th anniversary edition. I make no claims to be a distinguished expert on "Kane," but when you look at a film with thousands of eyes joining you, it's likely that sooner or later you'll have discussed just about everything discussable. Over the years, I did this process many times with my film class in the University of Chicago Fine Arts Program, and at the Conference on World Affairs at the University of Colorado at Boulder. I also did it at the Canadian Center for Advanced Film Study, the Smithsonian Institute, the American Film Institute, the Virginia Festival of American Film, the Philadelphia Film Festival, the Hawaii Film Festival, the Walker Art Center in Minneapolis, and the Savannah Film Festival. We reversed the film and looked at it again. The voice in the dark was correct. The chair movement isn't even subtle. An unseen hand clearly yanks the chair away from the path of the camera. But because our attention is naturally on the moving actors and not on an obscure chair in the corner, we miss it. We miss it so completely that in my 30 years of "Kane" shot-by-shots nobody had ever spotted it. Until now. "Thank you for the chair," I told the audience, quite sincerely. Next Article: Hollywood's highway to Hell Previous Article: Hey, kids! Anybody here not heard the F-word? Hey, kids! Anybody here not heard the F-word?